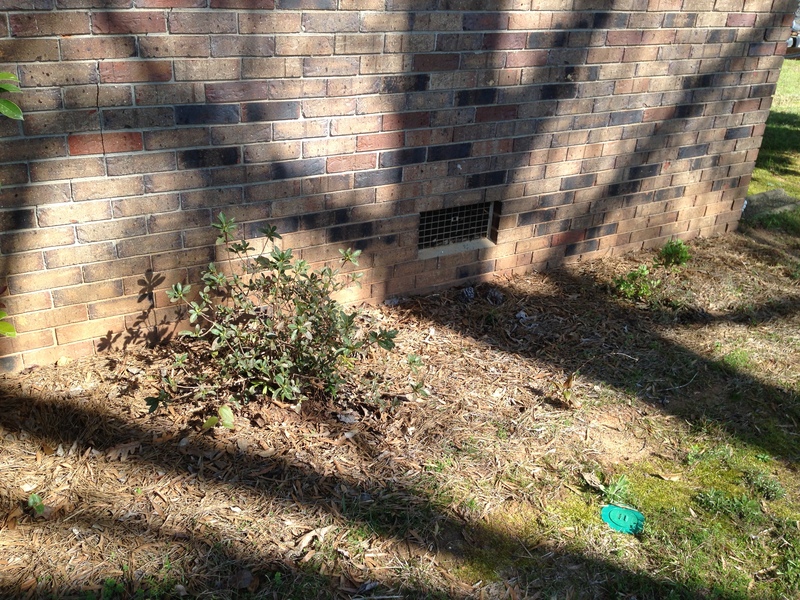 A neglected area much need of some lovin’….our front flower bed. Since moving in, I have wanted to update our flower bed in the front yard. However, time kept slipping away so fast, not to mention our budget never was really in favor of the idea – until this spring! It may be hard to tell from the photo, but there were already some (pathetic) azaleas planted – but NEVER grew. Also, the odd bush/tree thing going on in the center. After only a few minutes at TBones, I chose the Lorapetalums, Ever Red. First of all, I love the color red. Secondly, the folks at TBones basically said I would have to be intentionally trying to kill these for them to die. SOLD!!! 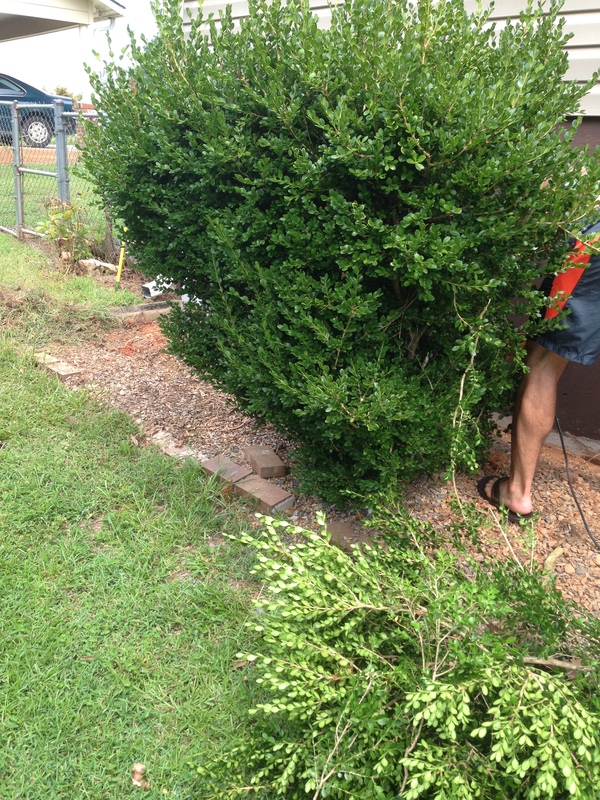 First, I pulled up the old bushes and loosened up the dirt. Levi helped me uproot the middle bush. As you can tell from the photo on the left, dealing with red Georgia clay is NOT easy. We planted five Lorapetalums evenly across the front. 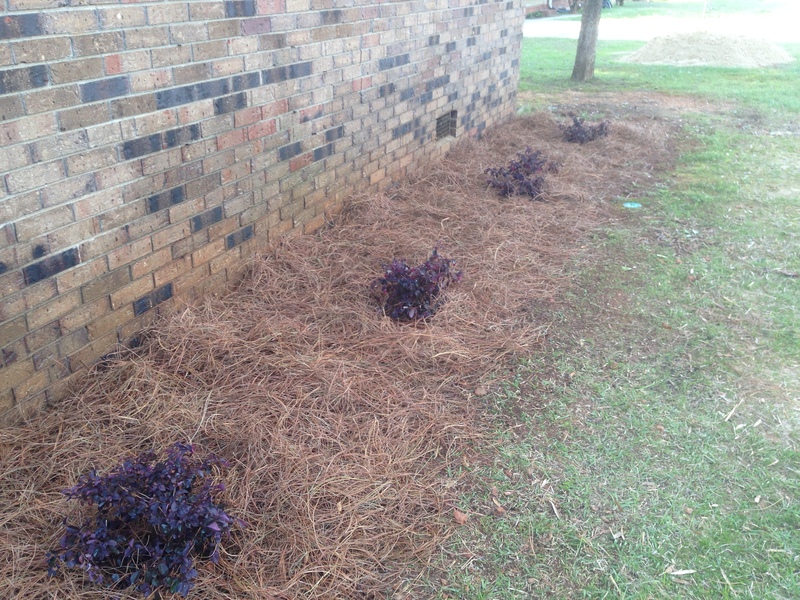 Then, we added some pinestraw that we raked from our neighbors backyard – Hey! We are on a budget!! And our neighbors could benefit too, so why not!? I LOVE how this turned out. A project that has been put off for so long feels so good to complete. All that’s left is a little watering, and to edge out the borders to keep grass out. It may not be much, but one little branch at a time will make a cozy nest! We finally finished our backyard transformation!!!! We are SO looking forward to fall weather, tailgates, and bonfires in our backyard with friends and family!! Of course, there is always work to be done. But for now, we enjoy! 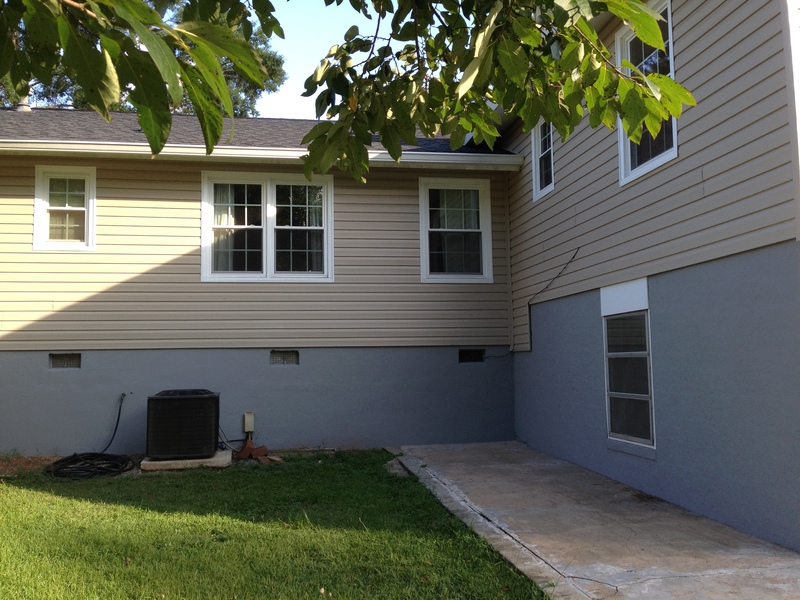 We were thrilled to be done with painting the stucco, but still our backyard transformation was not complete. The windows and doors were in much need of attention. 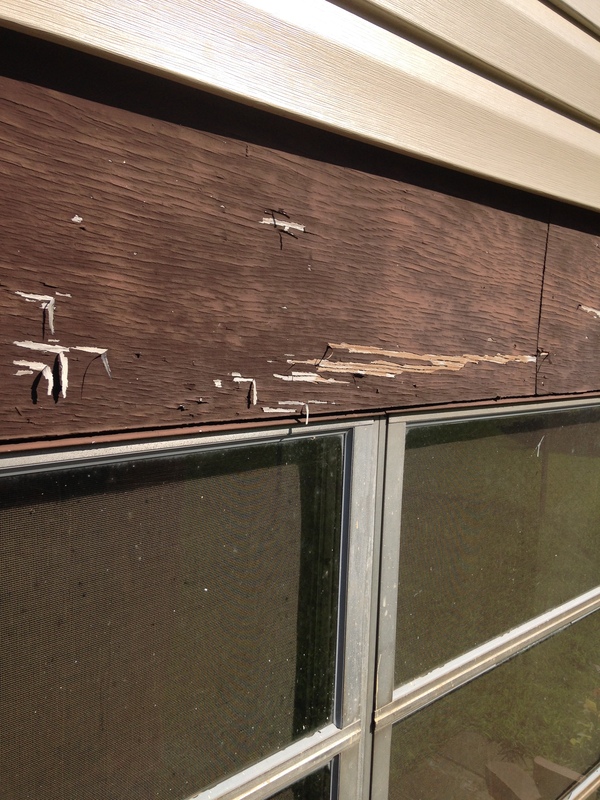 Levi had originally wrapped our windows with brown metal when the stucco was brown. (See it here.) They looked great! 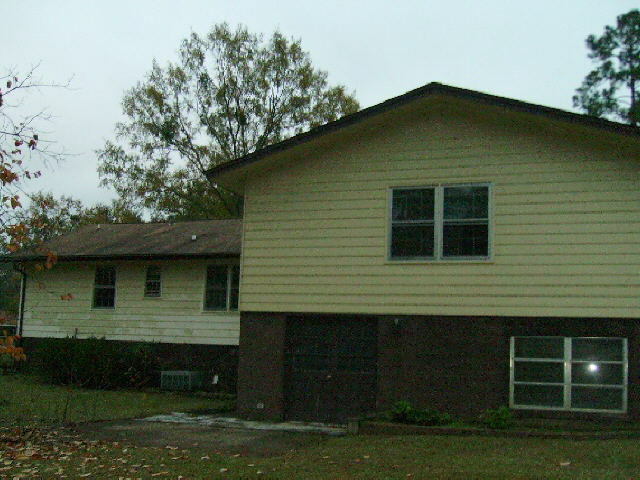 Now, however, the stucco was gray and the windows looked poop brown. My sweet husband ripped down the brown metal (that took two + hours) to replace it with pretty white metal. The original wood he used last time was sufficient since it would be covered up by the metal regardless. This made the process a lot faster. He again used a metal break to bend and cut the metal. This time, using white nails and caulk to seal them. What a difference it made! Eventually, we might replace the windows all together, but for now – one step at a time! We considered painting the crawl space door white, but decided to stick with gray to keep it hidden. 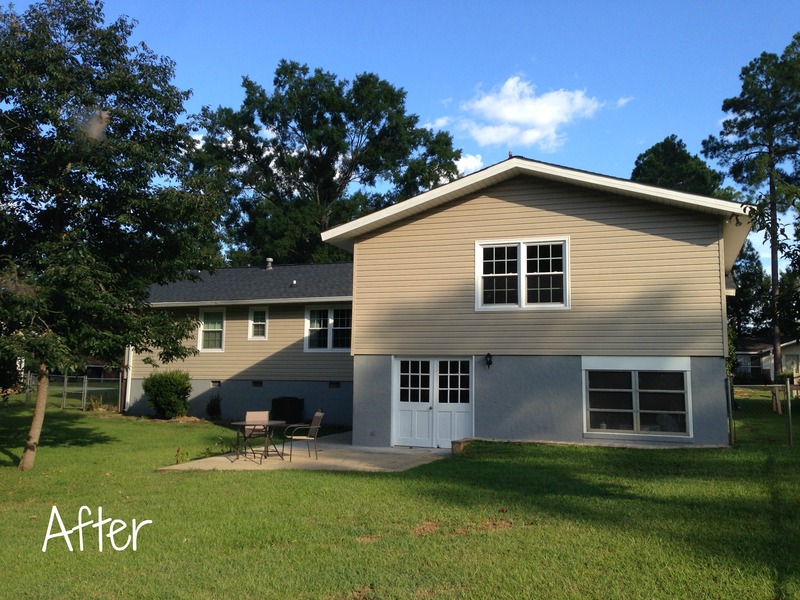 It had already been primed, so we easily painted it with the same “Summit Gray”. Two coats later, and that was done! Last step was what to do with the old basement doors. Just like the windows, we may eventually replace the doors altogether. Since the windows popped so well on the gray stucco, we decided to paint the basement doors white as well. Before we primed them, however, we had to sand the doors for the paint to stick as well as smooth out imperfections (which happen to be a TON). To the left was a picture of the original door. (Yucky, right?!) 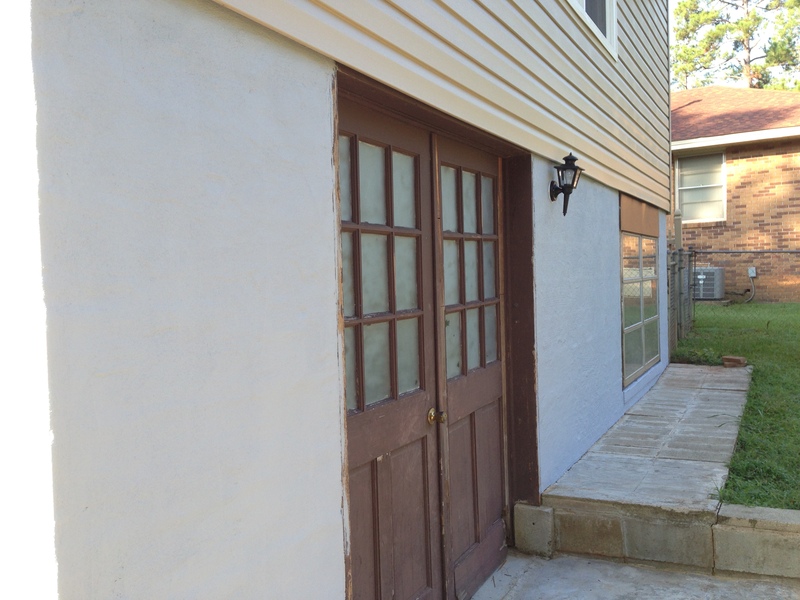 We primed the doors with the same primer as the stucco (probably a mistake, but we are not so fond of these anyway). 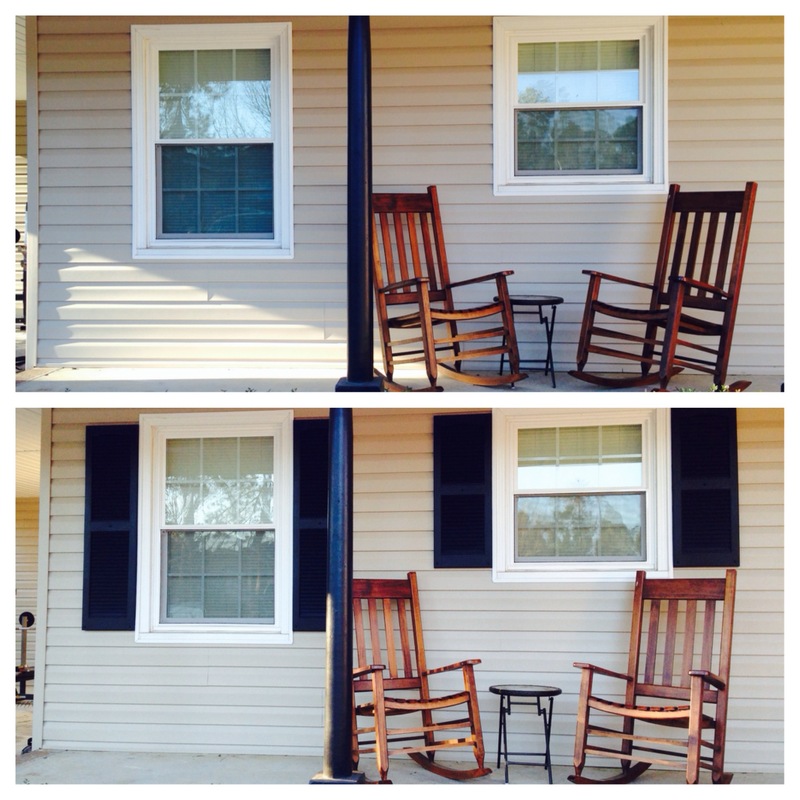 I painted these with a bright white exterior paint. Nothing too special, because again, they have seen better days. They really seem to stand out now!! Yes, these are the same doors!! One big difference is the actual windows. When we primed and painted, we used no form of painters tape. We had already decided to scrape off the frost that has been on the windows, since they were scratched and almost spooky now… Using a small scraper, I tirelessly scratched and scratched off the frost / dried paint. Much much better!! Windows and doors both taken care of now. The finished transformation coming soon!!! 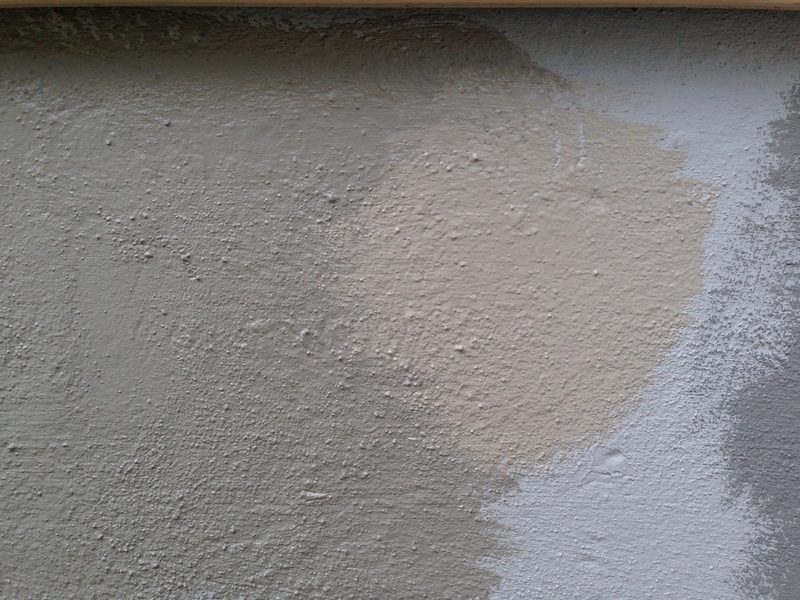 We contemplated and researched for a while… but finally made the decision to paint our stucco gray. 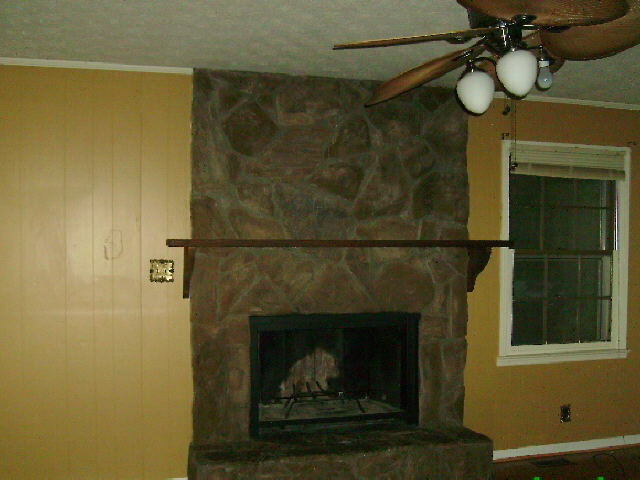 We used Sherwin Williams Masonry Primer to cover up the brown. We wanted to lighten up the backyard. Our house was built back in ’77, so we were hoping this would also make the outside look more up to date! This primer was not the cheapest, but was recommended for lasting longer. My patience and meticulousness won me the job of trimming! “I love trimming!” – said no one EVER. While I was trimming the edges, Levi went around pulling up grass against the side of the house. We wanted to get as close to the ground as possible in order to get the most coverage. 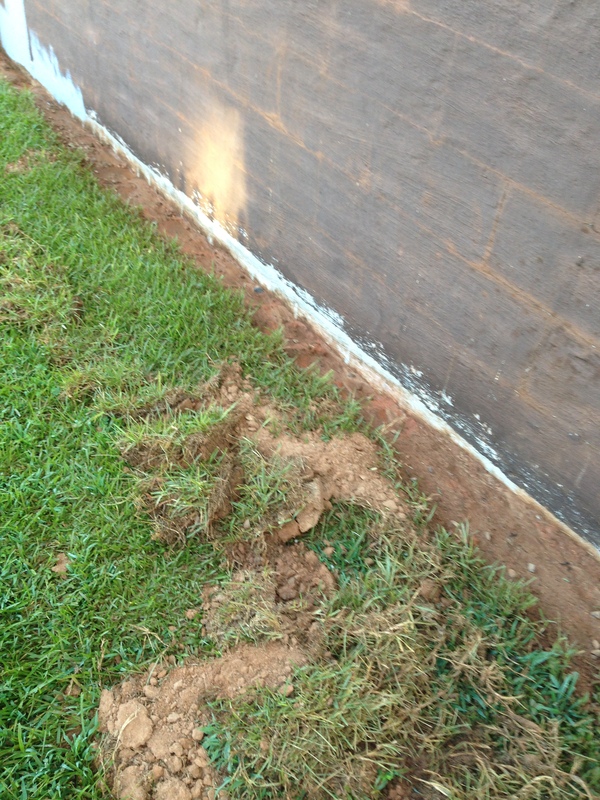 Eventually, we will move dirt back in for the grass to grow back. No more icky brown color! We applied painters tape to the concrete patio to get sharp definite edges. Levi also removed unnecessary wires (cable, etc) wrapping the others in painters tape, trimmed an obnoxious bush (which will be cut down very very soon), and pulled back the drain spout to prepare for painting those tough to reach places. The next weekend, we bought three paint samples. We were so anxious to get rid of the baby blue gray. One sample was dark with green undertones (“Cityscape”), the second blended with the tan vinyl with red undertones (“Summit Gray”), and the third was dark yet had blue undertones (“Software”). We painted a small sample of each in a shaded area of the stucco, as well as where the sunlight would hit. Lighting is important! There are millions of different shades out there. We just wanted gray. GRAY! How hard could it be? With some help from family and friends, we finally made a decision. We figured since the decision between the three was so difficult, any of our choices would look decent. 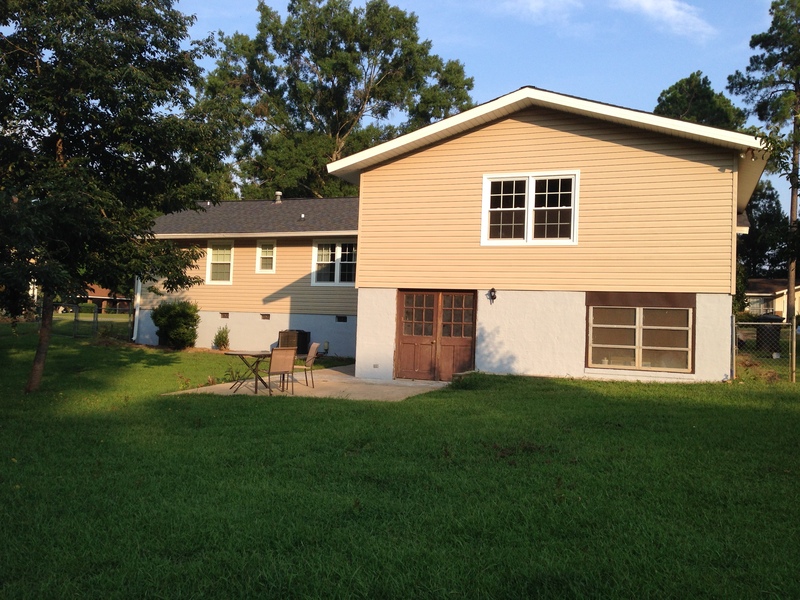 In hopes to make the house look bigger, we chose the one that best blended with the vinyl. The first ended up being way too dark, while the blue undertones scared us away from the third option. 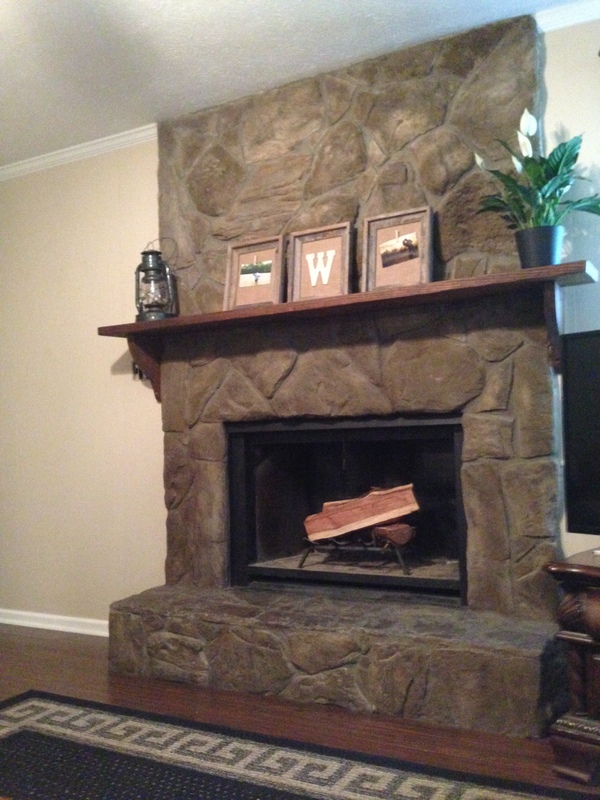 Therefore, we were left with the middle color… Sherwin Williams “Summit Gray”. 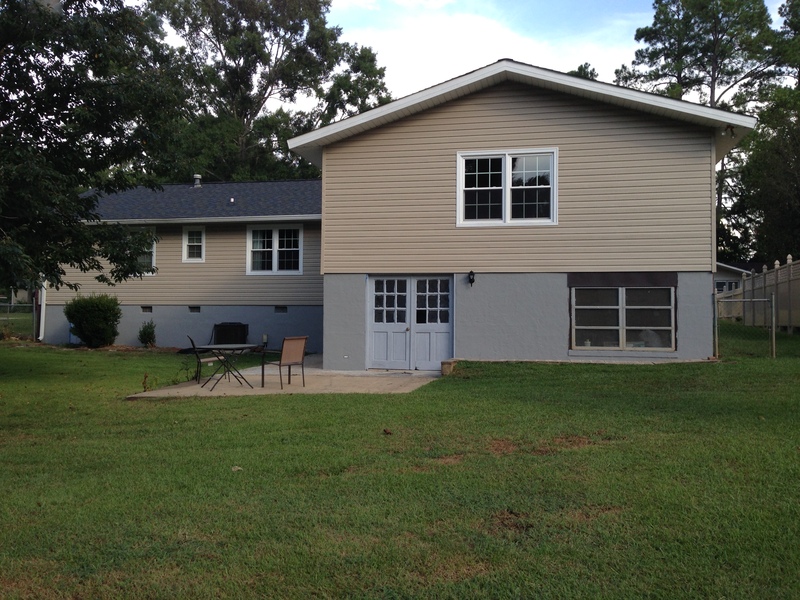 We used “Super Paint” which is an exterior latex acrylic mixed with the “Summit Gray” flat color. The back of the house took 2 gallons. 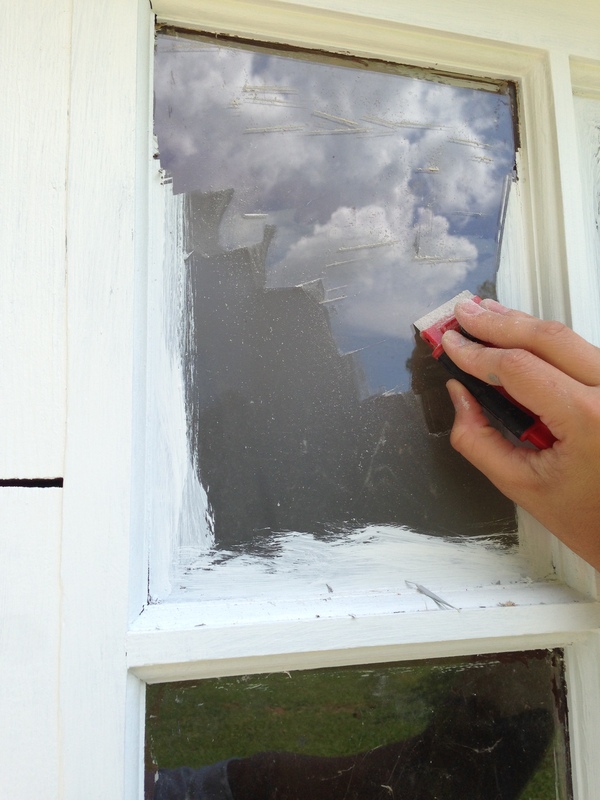 Super Paint is meant to withstand extreme weather and not fade or peel over time. 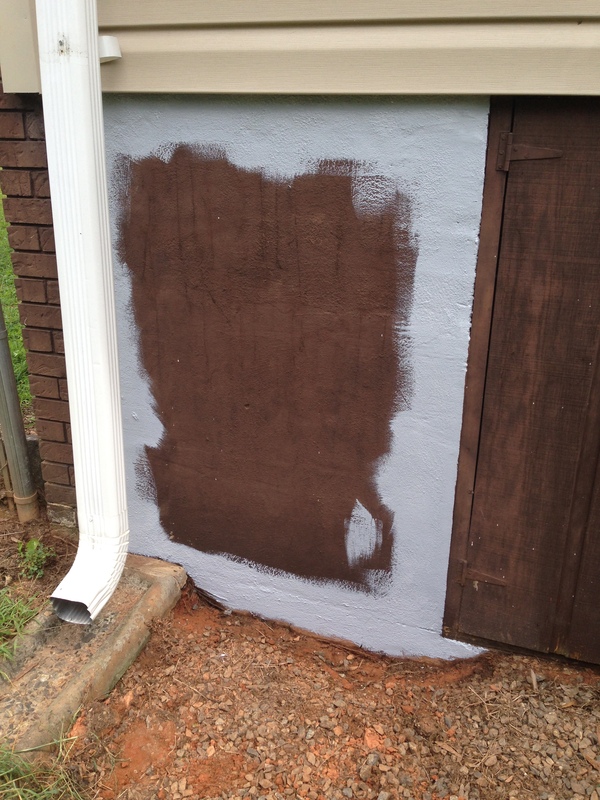 When we got ready to paint the first coat, we noticed all the summer rain storms during the past week had caused red mud to splash on the stucco. Levi rinsed off the mud while I began to trim over the concrete patio. 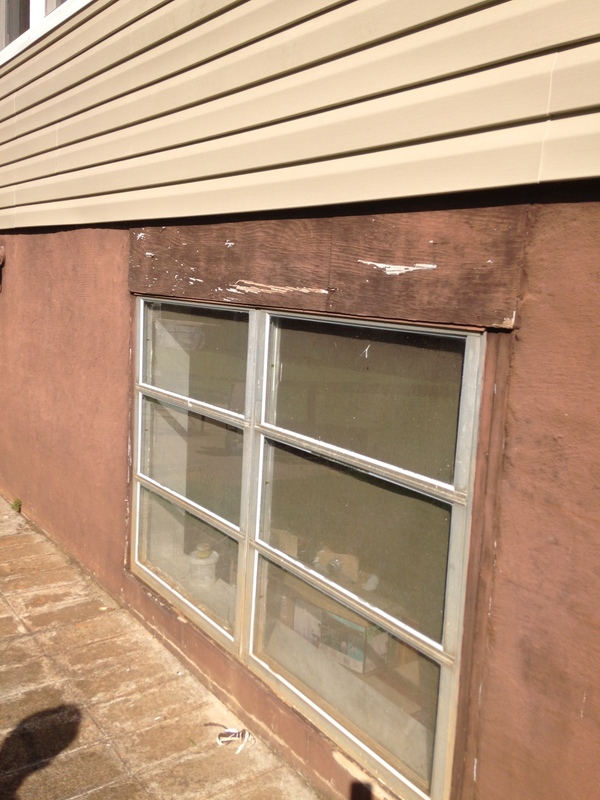 The stucco quickly dried (it was HOT that day) so that was no issue. Again, I trimmed, Levi prepped and rolled. We turned out to be a pretty efficient little team. 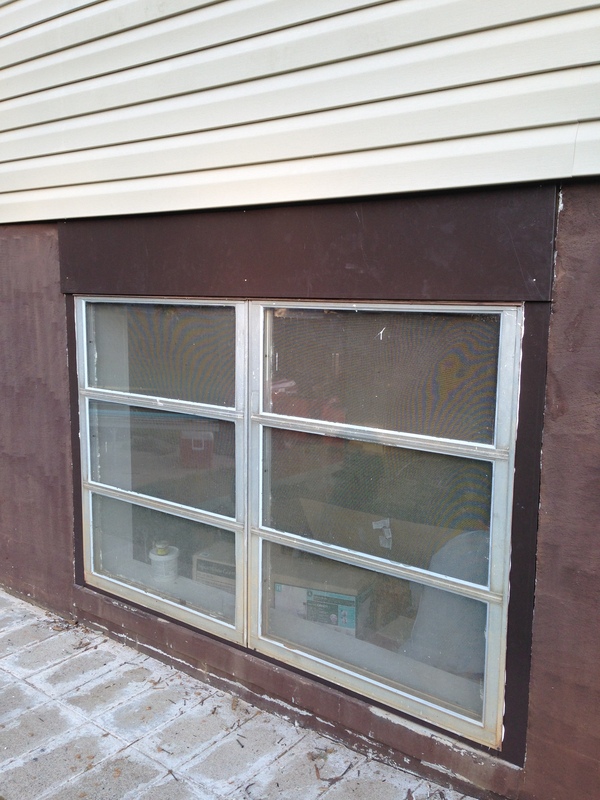 The first coat went on easy, but since the stucco is so uneven, we missed several spots the first go-around. This only took us about 2 hours one morning. It was refreshing to cover up what seemed to be a light blue. By the way, the wet paint was much lighter than the finished product!! The small square on the right is the exact same color that is on the left. The second coat thankfully went on thick and smooth. 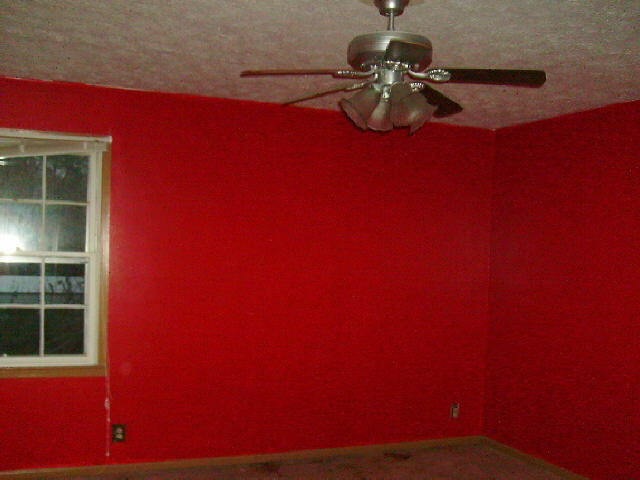 We waited one full day for the first coat to fully dry before attempting a second coat. We were satisfied with the color, thank goodness! The gray took years off the house. This was a long process, but well worth it. Now to update the windows and doors! Lately, our weekends have been so busy! We have been focused on fixing up our backyard for a while now. We didn’t really know where to start except to just simply clean up. What better way than giving the house a little wash down! We borrowed a pressure washer from Levi’s folks and got to work. What a difference it made!!! 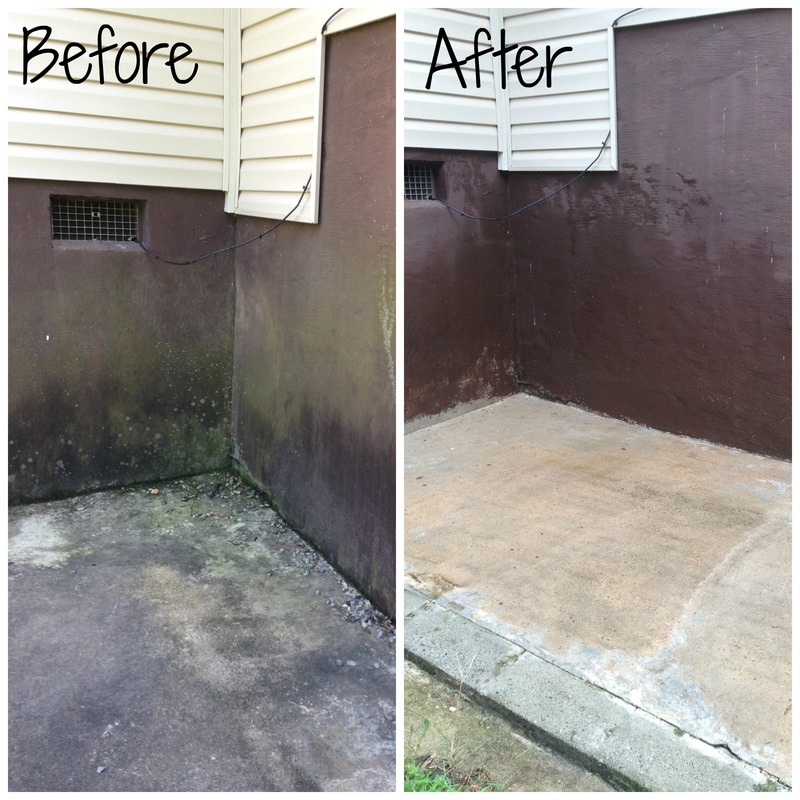 We pressure washed the concrete patio, vinyl, as well as the stucco surrounding the whole back of the house. Looks like new. The next part of the clean up was our lighting situation. 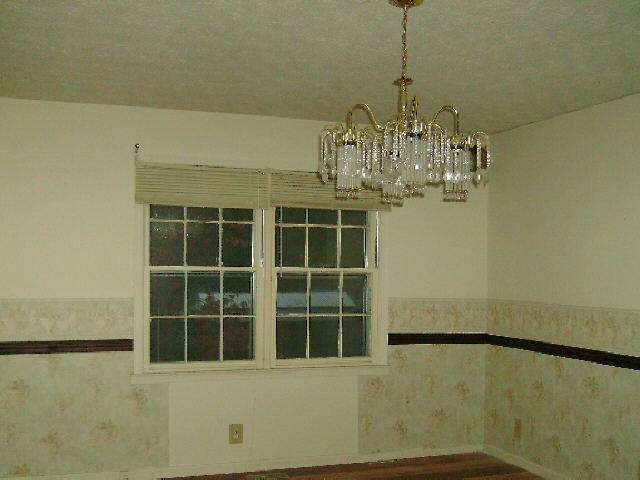 Levi changed out all the electrical switches on our corner lights, while I went looking for a new fixture by the door. Lighting – check! Levi decided to replace the old wood. Then, wrap some brown metal (using a metal break) around the wood to prevent it from rotting – not to mention making it look smooth and clean. Levi did this for another window on the other side of the house as well. “The Big Clean Up” took a couple weekends, but worth it! More to come!! Our air vents have gotten out. of. control. So this rainy Sunday afternoon we finally did something about it. We had contemplated buying new air vents earlier ($20 each at least), but decided to try a DIY project instead… SO glad we did!! 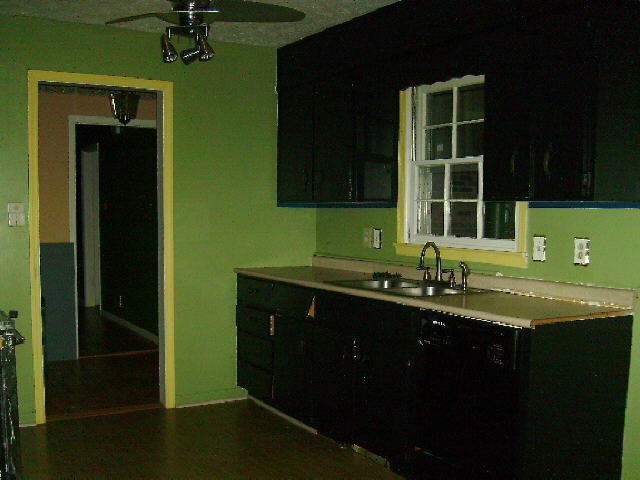 After they dried, we used Rust-oleum Spray Paint for appliances from Lowe’s (just a couple $) to paint them white again. It was raining, so we had to move this project under our carport (not the best idea with spray paint – but made it work.) 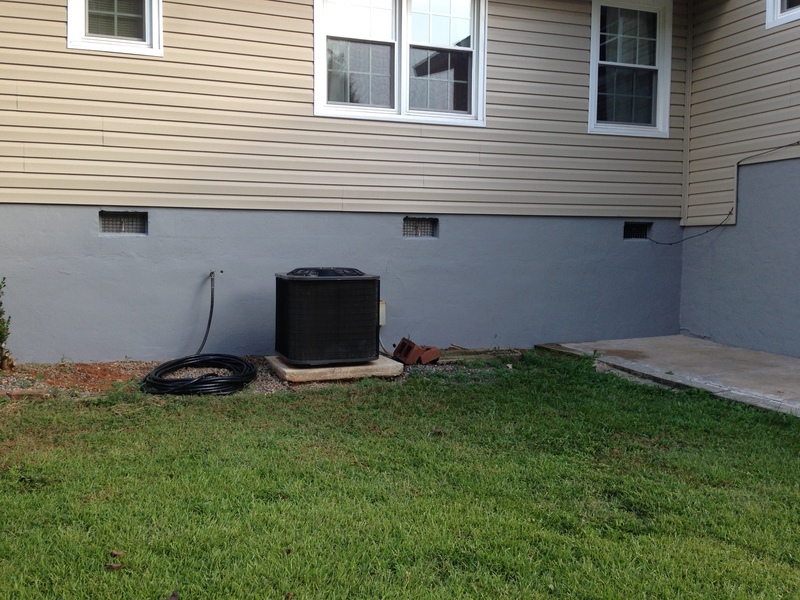 We propped up the vent using an old brick so we could paint both sides at one time without smudging. 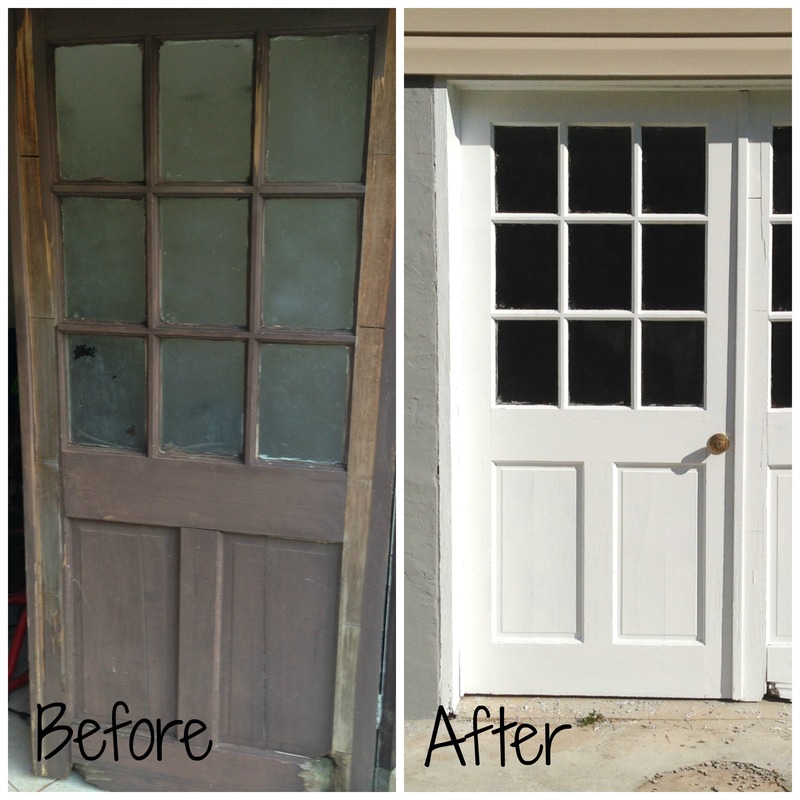 Here is one before and one after paint – AMAZING difference a little paint can do!! 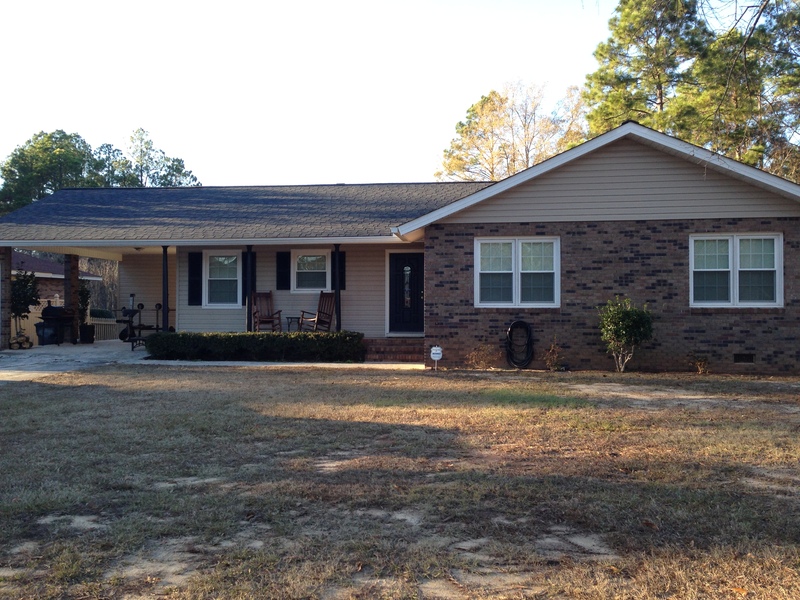 The finished project…. 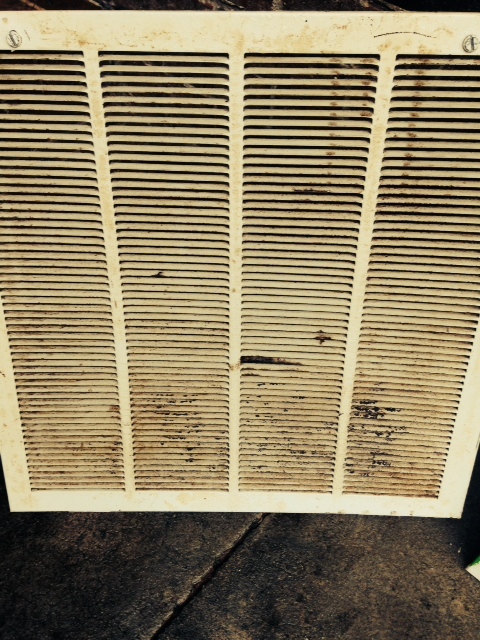 like NEW!!!! 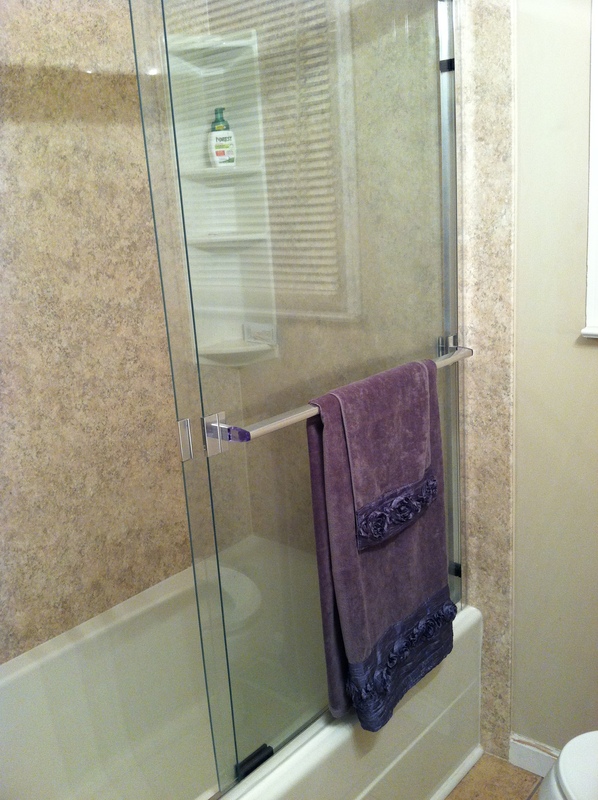 Sounds simple (because it was), but makes for a successful weekend project when we can save $$$$$!! You know you are getting “old” when you ask for home decor and accents for Christmas. 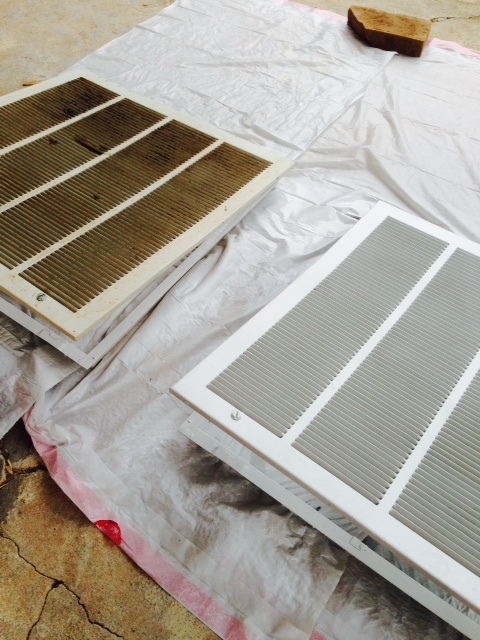 This past Christmas, we received SHUTTERS!!! Yes, we know this is a very lame gift to ask for from family; however, they made us SO happy! 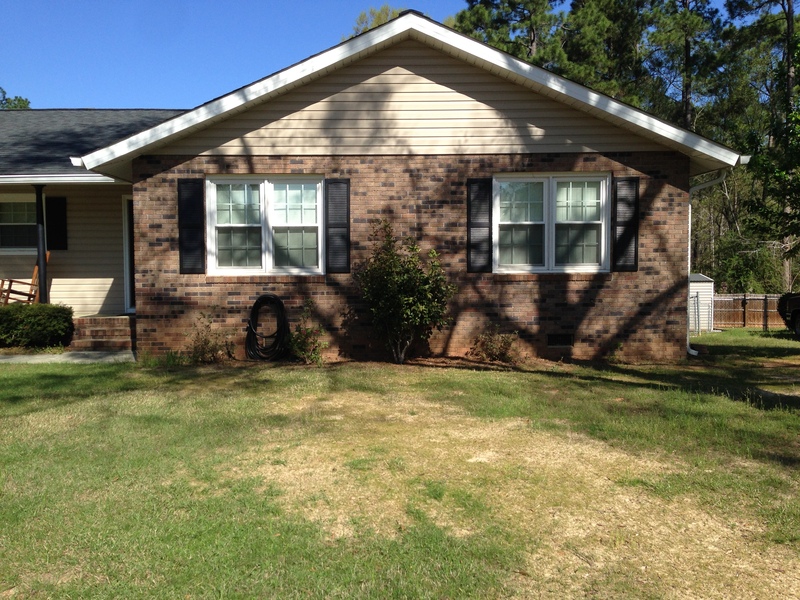 Not to mention made a big difference on the outside appearance of our home… Not much to most, but every bit counts! Christmas gifts can often be overlooked as ways to get some home improvement done. Always take advantage when you are asked what you want for Christmas (or birthday?!) by asking for things you can actually USE rather than meaningless “things”. We are already thinking of ways to improve our Nest – aka – what to ask for come Christmas time!! 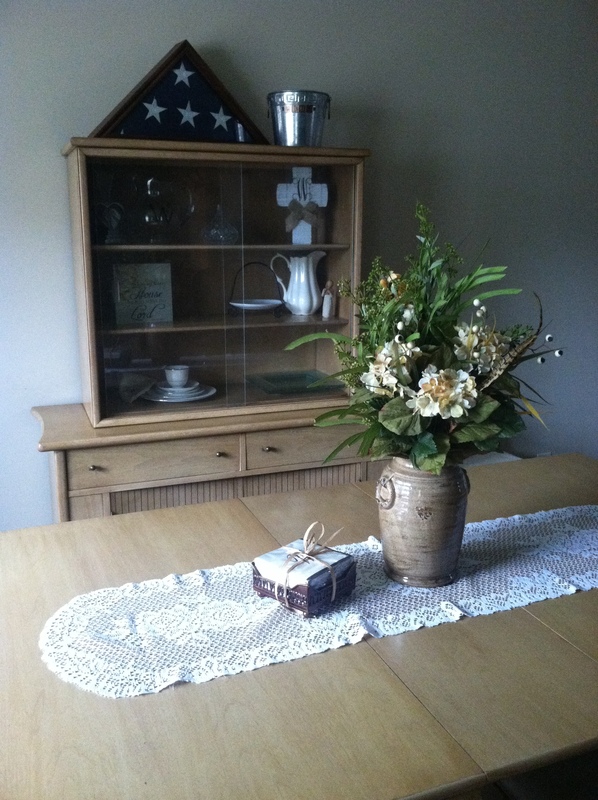 My husband, Levi, has several talents… One of them being quite the carpenter. At the early age of 19, he purchased a DUMP – I mean our home… 🙂 But only his eyes could see the jewel through the mess. This was just the beginning. Levi didn’t know at the time, but only a short five years later, his roommate would in fact be his wife (lucky me!) 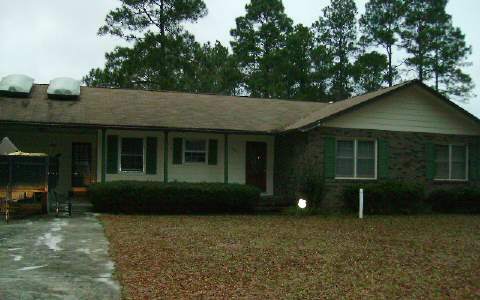 This was when Levi first bought our home. I am so proud of what my hubby accomplished in order to prepare for our future – even when he hadn’t met me yet! My, how much things have changed…. Levi and I got married April 20, 2013. Since we started dating, our finances have been a huge part of our lives. We LOVE a good deal, but more importantly – a budget! Everything we do is strategically planned and budgeted. (And not every project is a success story!) We understand that our home won’t be the same as our folks, who have been decorating and fixing up their place for over 25 years, but we are happy with our own unique “Nest”. 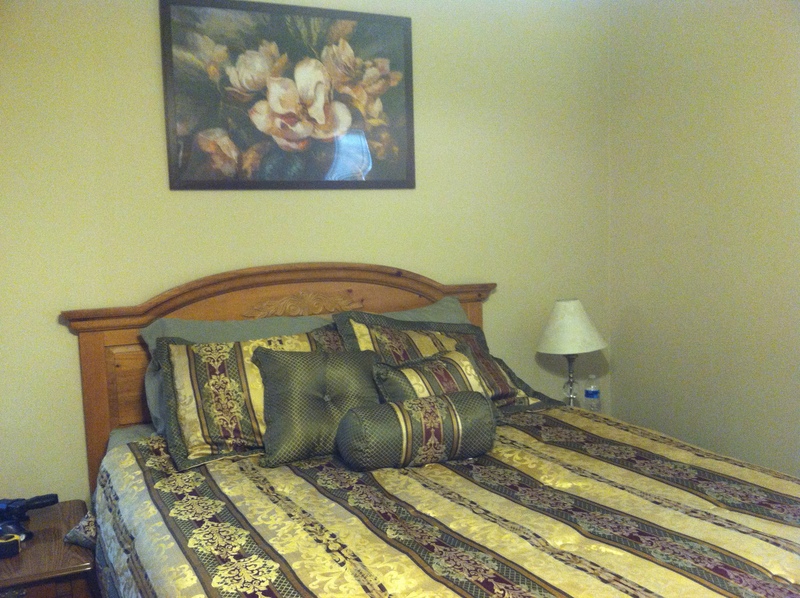 Our Nest is our lodging place, a retreat, a comfort, our home. One day we plan on growing our Nest, but for now we are content fixing up our place and living free. I plan to share our LOVE for home projects, fixer-uppers, sewing and crafts, everyday maintenance, tips/tricks, other improvements, and the making of our nest – The Wood’s Nest. 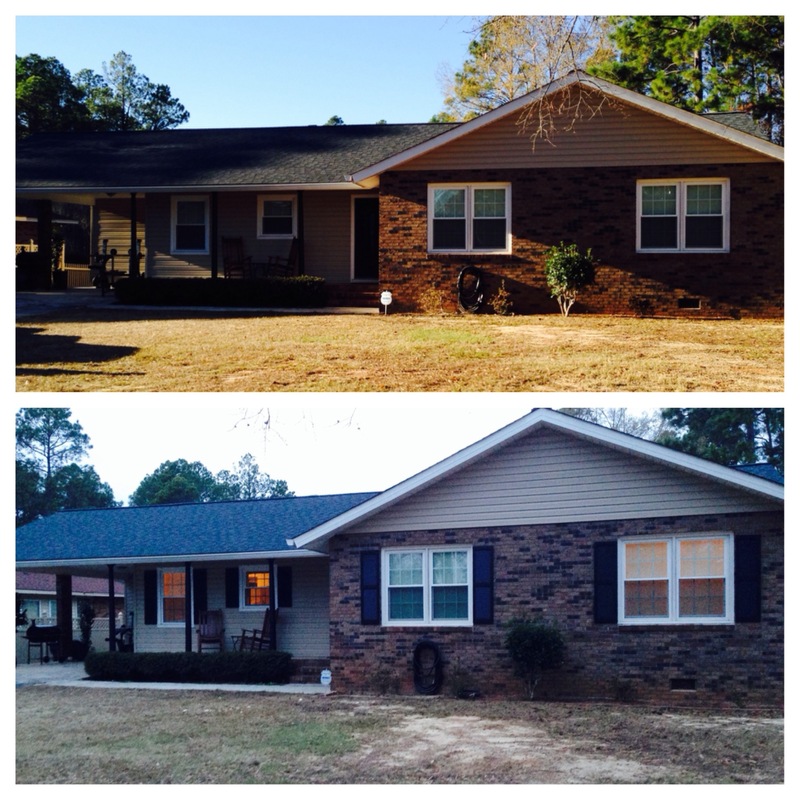 This home has come a long way, but there is always room for more improvements! !